Bridesmaid Duties | Teefa Says..
November, December and January are 3 kinda-busy months for me. Ada 3 orang kawan yang agak rapat kawen, and yours truly was one of the bridesmaids! Punya la lama tunggu diorang punye official wedding photos, tapi tak kunjung tiba. Last-last membebel pakai gambar simpanan sendiri. Ai ni memang sangat pelupa orangye so kene la jugak blog pasal weddings ni. Buat ingatan di hari mendatang. i'm honored to be a part of their wedding, even though it's small part. Walopon hanya menjadi dayang/pembagi bunga telur/penolong last minutes preparation/penggedik di gambar kawen orang/penggubah bunga, i had lotsa fun and learnt a lot. Boleh la saya praktikkan di hari perkahwinan saya kelak [ahem]. Bila lagi kita berkumpul ramai-ramai, had a perfect reason to tempah baju cantik-cantik, watch the girls drama live, cam whore mcm orang gila kan? Nah gambar. Dicilok dari FB mereka and camera sendiri. It was held at Dewan Dato' Siti Hasmah (located belakang Dewan Bahasa dan Pustaka) and was a simple and beautiful wedding, tapi agak kelam kabut for us the bridesmaid. Upon arriving we were busy arranging the bridesmaid bouquets that we didn't realize that the bride and groom were already at the entrance, waiting for us to walk down the altar. Kelam kabut. Ekin was practically in tears. It went well in the end. Phew~! 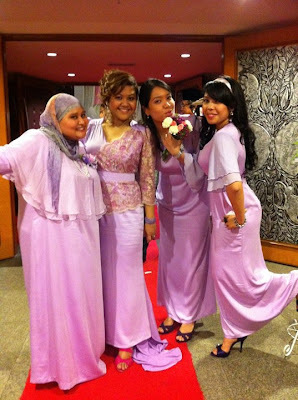 The joy of being a bridesmaid: Gambar extra-gedik with the bride and groom! 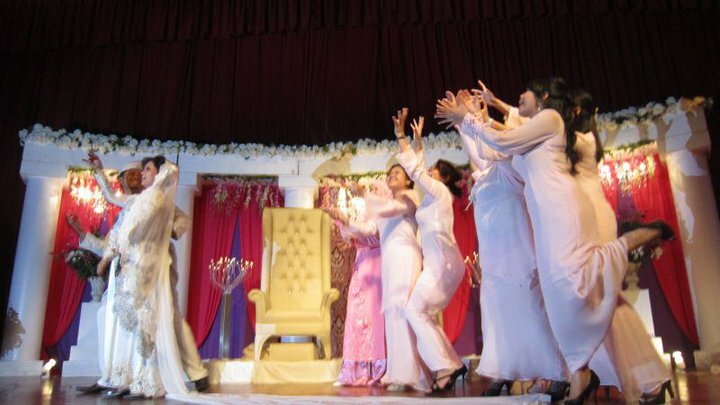 But the myth that says the bouquet-catcher will wed next is so untrue coz Awin was the one next in line! With my favourite flower; Gerbera daisy. The only decent picture of the happy couple and i. Wedding yang traditional, sederhana tapi meriah! Living in KL, i've always been to weddings that are held at a hall, restaurants and hotels. 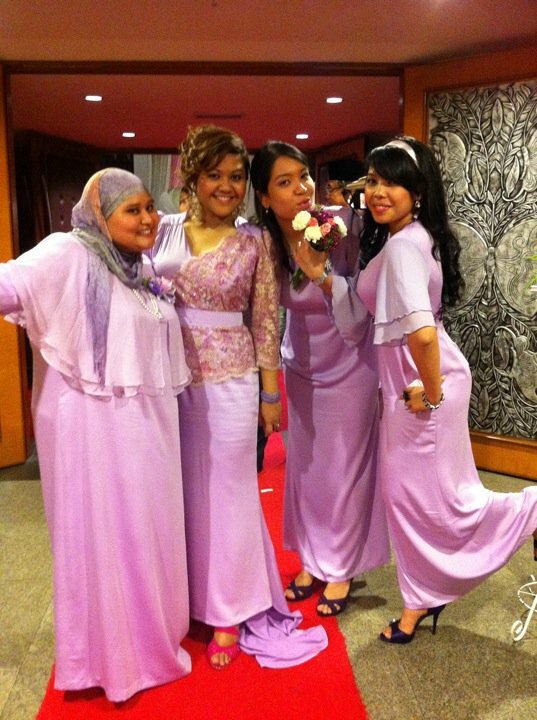 Not a traditional Malay wedding. In's wedding was held at her parents house, in her hometown in Merlimau, Melaka. 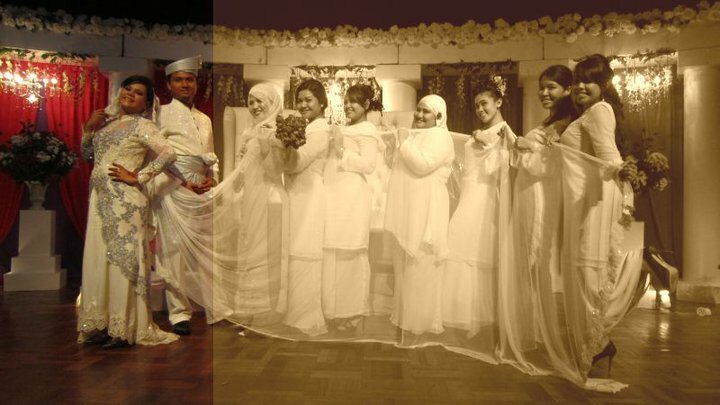 Her wedding is a complete traditional affair with bernikah ceremony, malam berinai, and majlis bersanding all at her house. It was a breath of frseh air for me and i was so jakun and excited! Memang terasa kemeriahannya. Orang kampung gotong-royong, pelamin buatan sendiri, and her nikah ceremony was the MOST EMOTIONAL ceremony that i've been to. 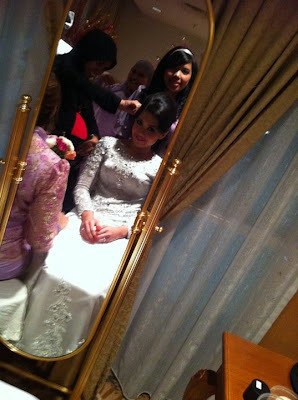 In Melaka, it's a tradition that the bride's mom give a short speech/advice to the bride. Percayalah ucapan itu adalah sangat mengharukan. Contoh ayat adalah "Mak dah jaga kamu baik-baik, sekarang mak lepaskan kamu. Jadilah isteri yang solehah...". In return, the daughter will make a short vow to be a good wife and mother and say her thanks to her family. Sedih wooo. Hampir semua tetamu menangis. Pengantin lagi la meraung. Two bridesmaids and a bride. 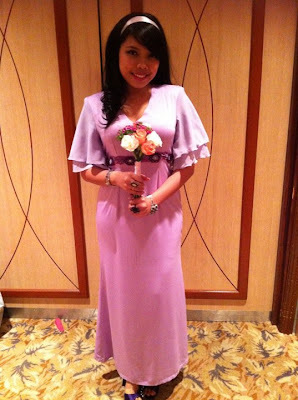 Double duty: bridesmaids dan penggubah bouquet! Uni mates! Linda, Siti, Mawai and moi! Fret not, i managed to take photos using my phone. Specifically with my LomoLomo application. i ADORE this application! 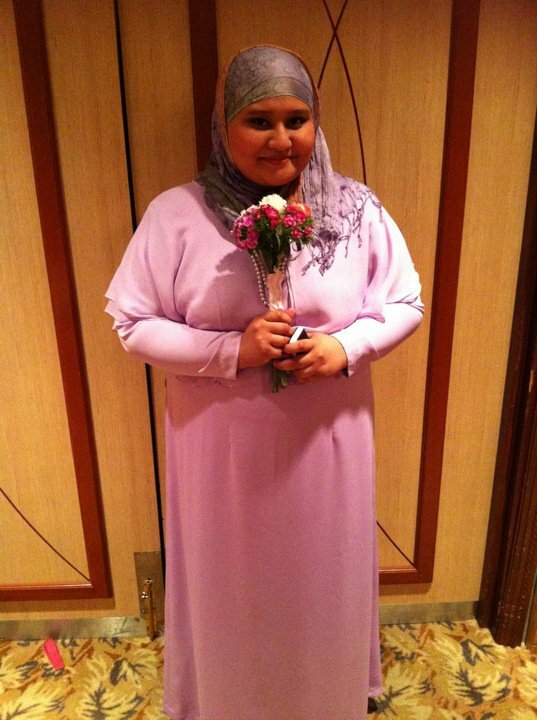 Me in a modest purple maxi dress. She help designed my purple maxi dress. Begitu lah serba sedikit cerita jadi bridesmaid. Seronok, penat, girly dramas, gediks all mixed together to create sweet memories. Nanti aku kawen ntah la macam mane keadaannye. Hehe.